• Prevent & Cure – Diabetes, Heart Disease, B.P. Disorder, Asthma, Acidity, Gastric Troubles? • Become Free from – Anger, Fear, Pessimism, Haughtiness, Laziness, Depression …………….? • Develop – Strong Will-power, Optimism, Boldness, Compromising Nature, I.Q.,E.Q,S.Q. …… .? • Lead a life full of – Mental Peace, Tranquility, True Happiness, Cheerfulness, Congenial Relations with Spouse, Children, Parents, Friends .….? Date: Thursday, 11 November 10 to Thursday, 15 November 10. Reach venue on 10 November 10, between 6:00 p.m. and 10:00 p.m.
Venue: Terapanth Bhavan, Adhyatma Sadhana Kendra, Near Chhattarpur Mandir, Chhattarpur, Mehrauli, New Delhi, India. In the auspicious presence of Prof. Muni Mahendra Kumar. B. Sc. (Hons. ), Agama-manisi and preksha-pradhypaka. Training by Eminent Faculty: Mr. Arun Jetha bhai Zaveri and Mrs. Mayuri Arun Zaveri [from Mumbai]. What is Preksha Meditation (PM)? Preksha means inner perception. 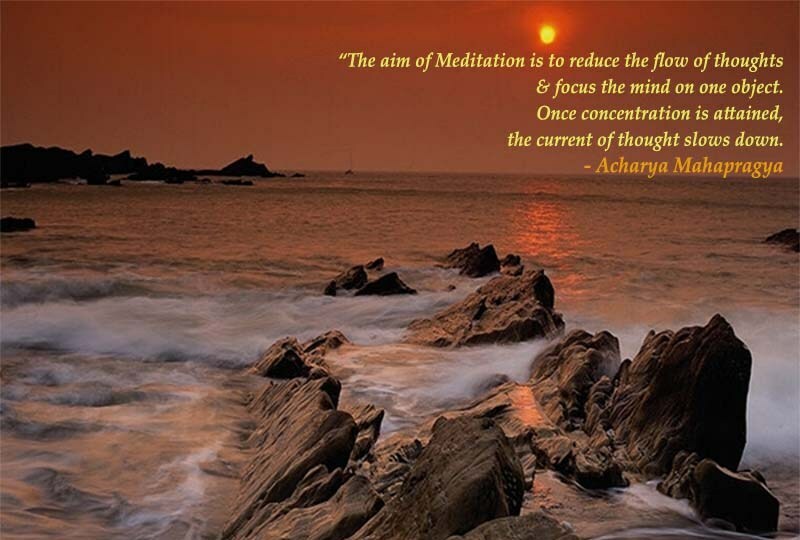 In this technique, one learns to concentrate his mind on the subtle aspects of one’s own consciousness through the practice of preksha and brings about desirable changes via contemplation, colour-visualization and auto-suggestions. The true path to better living should not only include proper nutrition, clean air, and physical exercise, but also prevention and elimination of the very roots of psychosomatic diseases – stress, negative thinking and destructive emotions. Preksha Meditation is a tool that helps relieve and reduce the effects of physical and mental stress and eliminate emotional tensions and disorders by enhancing emotional maturity. PM was practiced by sages and seers centuries ago, and the art was passed on from generation to generation through the Indian tradition of knowledge and wisdom. It was discovered from the ancient wisdom and corroborated with modern scientific theories by Acharya Mahapragya an internationally known Jain Saint, who has co-authored with Dr. A.P.J. Abdul Kalam the famous book “The Family And The Nation” . Medical research has revealed that emotional state of a person is directly connected with the Limbic System and Neuro-endocrine system. Emotional tensions can disrupt the complex and delicate balance of numerous hormones secreted by the different endocrine glands in the body, which ultimately cause various physical and mental diseases. PM works by gradually leading the practitioner to experience deeper levels of his/her consciousness and remove stress and emotional tensions hidden in the subconscious mind. It enhances emotional maturity and harmonizes the neuro-endocrine secretions which represent the emotions, urges, and feelings, and thereby cure psychosomatic diseases. The Preksha Meditation course material was well presented and definitely enlightening. The workshops were very effective. It widened my mental horizons… made me relax and stay mentally alert at the same time. Preksha Meditation has helped me increase my self-confidence, mental stability, and mind concentration. The main achievement is that my anger has reduced drastically. I was suffering from depression since last three years in spite of having a well-to-do family – educated children and a loving husband. I often had suicidal thoughts and had planned to end my life many times. After learning and practicing meditation exercises I am out of depression and enjoying my life again. I have laughed again after several years. I had chronic pain and was interested in gaining some control over my health problems when I came to the workshop. After regularly practicing PM for about two weeks the pain has lessened considerably and I feel great. Thank you! Limited seats available. Enroll today. Fees: Rs.3300/- including all charges of lodging, boarding, training material. Terapanthi Sabha”, Please deposit in any branch in India, of the Canara Bank, account number 0158101007538. Facilities: A.C. Rooms, Wholesome Diet- Breakfast, Lunch, Tea, Dinner. Special instruction: Wear loose white clothes. Outside eatables and going outside the premises is strictly prohibited. "Aim of meditation is to reduce the flow of thoughts, and focus the mind on one object (e.g. 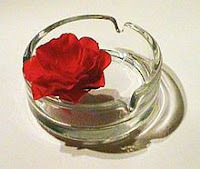 breath), once the concentration is attained, the current of thought slows down". We cannot prevent crises but we can overcome misery. To experience a crisis is one thing, but to suffer it is different. Awareness of a problem is one thing but sensitivity to it is quite another. The best way to reduce cravings is to tell yourself that wealth is not everything; it is only a means to sustain you on the journey of life. Happiness is a habit, and peace is the effect of cultivating it. Peace implies a holistic development: Emotional, mental and physical. Most people are deluded into earning for the sake of acquisition of more and more wealth, and NOT happiness? Wealthy people are not necessarily happy people. You can buy comfort and material things. But happiness and comfort are totally unrelated. Acquisition is one thing, happiness is quite another. How do we calm our wavering mind? Mind pacifying is a process of continuous removal of distorted views, indulgences, distractions, anger, and other passions. Practical exercise: Close your eyes and concentrate on your nostrils. Experience the air going in and coming out. Just watch the inhalation and exhalation. No need to hold the breath. This exercise is called 'perception of breathing' (स्वास प्रेक्षा). Only those people with an objective view can find solution to problems. One should think analytically and critically – and with detachment. Think, that is, from outside a situation. This me, this is mind, and this is the problem. I am standing inside the door and the problem is outside. Then a solution will offer itself. If thieves are allowed inside the house theft is bound to happen. If a mind is overwhelmed with problems and cannot free itself from them it will turn too pessimistic to think of a solution. Life alternates happiness with turmoil. Sometimes life is good, sometimes the opposite. Sometimes we are praised and sometimes condemned. We need strength (fortitude) to cope with whatever is meted out to us. Every moment of our life can be blissful. Instead we get overwhelmed by memories of the past and dreams of the future. In a meditative state memories and dreams do not surface. At that time you live in the present and yo realize that the happiness you seek outside is flowing inside you. Practicing Preksha Mediation system implies consistency – consistent improvement and consistent transformation. What should we do to achieve peace of mind? DO NOTHING. To do nothing is emptying the mind, and an unfilled mind is a peaceful one. In an empty mind self-awareness can take place. This emergence of consciousness is peace of mind. Internal awaking is manifest in external inactivity. Peace is not dullness of mind- it is the burning of an internal flame. Is it possible that water in pot placed on a burning stove will not get hot? Similarly, is it possible that a mind placed on impure emotions will not get tempered, agitated and disturbed? Practical exercise: If you wish to calm your inner agitations, mediate on stilling the tongue. If you have mastered keeping your tongue motionless you have learned to calm you mind. This write-up is based on teachings of Preksha Meditation system. World No Tobacco Day is observed around the world every year on May 31. It is meant to encourage a 24-hour period of abstinence from all forms of tobacco consumption across the globe. The day is further intended to draw global attention to the widespread prevalence of tobacco use and to negative health effects, which currently lead to 5.4 million deaths worldwide annually. Since 1987, the day has been met with both enthusiasm and resistance across the globe from governments, public health organizations, smokers, growers, and the tobacco industry. Government income: Areas listed as excisable by many governments, and considering the thinkers' comments: To protect people – from harming their health by abusing substances such as tobacco and alcohol. To provide monies needed – for the extra healthcare and other public expenditures which will be needed as a direct or indirect result of excisable activities, such as lung cancer from smoking or road accidents resulting from drunk driving. Root cause of the problem is stress. The real solution is to provide better solution release the stress. Meditation can drain out the tensions, especially mental tension, without any side effects. Let us observe the 'No Tobacco' day by practicing the exercise of 'complete relaxation with full awareness'. Please share this blog with your friends by clicking on the 'share' button on top right. I will appreciate your comments. What do you say? Question: What are the thumb rules for a layman to take care of his heart? Question: Is eating non-vegetarian food (e.g. chicken, fish) good for the heart? Question: What are the ways in which the heart is stressed? What practices do you suggest to de-stress? Question: Is walking better than jogging or is more intensive exercise required to keep a healthy heart? Question: You have done so much for the poor and needy. What has inspired you to do so? Question: Can people with low blood pressure suffer heart diseases? Question: How do irregular eating habits affect the heart ? Question: How can I control cholesterol content without using medicines? Question: Can yoga prevent heart ailments? Question: Which is the best and worst food for the heart? Question: Which oil is better - groundnut, sunflower, olive? Question: What is the routine checkup one should go through? Is there any specific test? Question: What are the first aid steps to be taken on a heart attack? Question: How do you differentiate between pain caused by a heart attack and that caused due to gastric trouble? Question: What is the main cause of a steep increase in heart problems amongst youngsters? I see people of about 30-40 yrs of age having heart attacks and serious heart problems. Ans: Increased awareness has increased incidents.. Also, sedentary lifestyles, smoking, junk food, lack of exercise in a country where people are genetically three times more vulnerable for heart attacks than Europeans and Americans. Question: Is it possible for a person to have BP outside the normal range of 120/80 and yet be perfectly healthy? Question: Marriages within close relatives can lead to heart problems for the child. Is it true? Question: Many of us have an irregular daily routine and many a times we have to stay late nights in office. Does this affect our heart ? What precautions would you recommend? Question: Will taking anti-hypertensive drugs cause some other complications (short / long term)? Ans : Yes, most drugs have some side effects. However, modern anti- hypertensive drugs are extremely safe. Question: Will consuming more coffee/tea lead to heart attacks? Question: Are asthma patients more prone to heart disease? Question: How would you define junk food? Ans : Fried food like Kentucky, McDonalds, samosas, and even masala dosas. Question: You mentioned that Indians are three times more vulnerable. What is the reason for this, as Europeans and Americans also eat a lot of junk food? Question: Does consuming bananas help reduce hypertension? Question: Can a person help himself during a heart attack (Because we see a lot of forwarded emails on this)? Question: Do, in any way, low white blood cells and low hemoglobin count lead to heart problems? Question: Sometimes, due to the hectic schedule we are not able to exercise. So, does walking while doing daily chores at home or climbing the stairs in the house, work as a substitute for exercise? Question: Is there a relation between heart problems and blood sugar? Question: What are the things one needs to take care of after a heart operation? Question: Are people working on night shifts more vulnerable to heart disease when compared to day shift workers? Question: What are the modern anti-hypertensive drugs? Question: Does dispirin or similar headache pills increase the risk of heart attacks? Question: Why is the rate of heart attacks more in men than in women? Question: How can one keep the heart in a good condition? Source: Based on transcript of the chat with Dr. Devi Shetty (Heart Specialist). This was arranged by WIPRO (one of largest IT service comapnies) for its employee. Why more choice makes people miserable? 17 April 1911 - 17 November 1993. Founder and Managing Director of Bharat Bijlee Ltd., for 33 years. Past Chairman, IEEMA. Member Institute of Standards. His contribution to Electrical Industry as a great industrialist of his time is remembered even today. He was described as Bhisma Pitamaha of the Indian Electrical Industry in India. He was one of the first industrialist in India to have foreign collaboration with Siemens (Germany) in 1959. There are many people who practice and preach science of living. Jethabhai not only did this, but also demonstrated science of dying. He embraced Samthara and left his body on November 17 1993. “Economic development and oversupply of consumer goods cannot reduce violence and crime. On the contrary, they can be instrumental in increasing them. The future of humanity lies in a balanced development of work, wealth and self-restraint. Labour and wealth represent the basic aspects of life. On the other hand, self-restraint represents life’s spiritual aspect. A mentally steady life is impossible to conceive if education or training is not based on all the three.” He has written many books and translated many Jain scriptures into English. Hon. 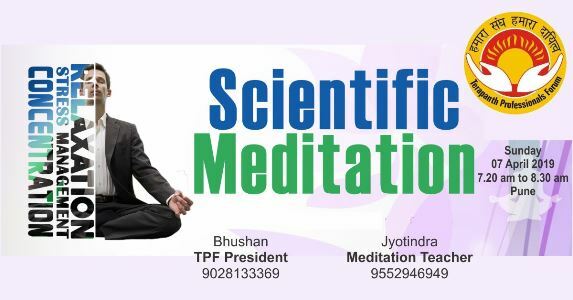 Professor of Science of Living at Jain Vishwa Bharati Institute (Deemed University), Rajsthan, India. Mahendra Muni has mastered the Avadhan vidya (Shatavadhani). Technique of high concentration, amazing memory and computation power like computer. Memory is an inherent quality of consciousness and Avadhan is a process for developing the same. He can memories Sanskrit Couplets, long numbers with many digits, sentences of unknown languages, etc. merely by listening to them only once! He is also excellent in Mathematics. Mathematics is another facet of Avadhan, whereby problems requiring hours can be solved in a few minutes. Author of over 15 books on philosophy, comparative studies on Science and Philosophy, Meditation, Mathematics, Atomic Science, and Jainism, etc. India has ever been a breeding ground for the spiritual Sciences. Whereas the occident has applied its resources for the development of Nuclear (atomic) energy, Indian saints and sages have devoted their attention for the development of spiritual power and have achieved wonderful success. He along with Acharya shri Mahaprgna had several meetings with the President of India A. P. J. Kalam. He is third son of Mr. Jethalal S. Zaveri. He graduated in B. Sc. first class first in the University of Bombay, 1957. He was initiated as a Jain Sadhu by Acharya Shri Tulsi. Muni Mahendra has good command over Sanskrit, Prakrit, Pali, English, German and other languages. He has written and edited number of books on Preksha Meditation. Helpful information about Preksha meditation. Preksha is a process of awakening ones own reasoning mind (Viveka) and thereby control ones passions and emotions. It is based on the principle of engaging ones mind by concentrating on the perception rather than on thought. The perception, again, is that of internal phenomena of consciousness and not that of external objects. "Preksha is a process of awakening ones own reasoning mind (Viveka) and thereby control ones passions and emotions. It is based on the principle of engaging ones mind by concentrating on the perception rather than on thought. The perception, again, is that of internal phenomena of consciousness and not that of external objects."